Can I get all the nutrients I need from my food? The widespread view – and one usually portrayed in the media – is that supplements are unnecessary. And, even worse, a waste of money. While we'd agree with the later in many instances – although not for the reasons you may think – these days even the healthiest of diets is unlikely to give all the nutrients needed for full health. So why is this and what's changed? Turn back the clock a few decades and the majority of food was produced locally. Farms tended to be small and mixed, with animals as well as food crops. Animals produced manure, which was used on the fields producing crops. Each year different crops were grown on each field, so reducing pest problems as well as maintaining the balance of nutrients, organic material and micro organisms necessary for health soil. Seed was collected to be used the next year. Animals were bred on the farm and spent their lives outside, grazing on pasture, topped up with hay or other crops grown on the farm. Farming was a largely self sufficient activity. Fast forward to the present day and farming is very different. It's now an industrial process with large farms being the norm, often covering thousands of acres. Mixed farms have been replaced by purely arable or animal farms, often specialising in one or two crops. As soon as one crop has been harvested, the next is planted, with no time to leave land fallow to regenerate. Manure has been replaced by chemical fertilisers, natural pest control by pesticides. Animals no longer spend their lives on the same farm, but are moved between units, often when only a few days old. Many spend the majority of their short lives inside, with their feed designed to minimise the time between "farm and fork." With such intensive methods of farming, is it any wonder that our food doesn't have the nutrient values it once had – or that soil has become so depleted? And this is without taking into account a myriad of other factors. The continued breeding of both crops and animals, where the focus is on the speed it can reach the fork, not on nutritional content. And not forgetting the distance food travels, whether in the UK or abroad. Or how long it's stored in refrigeration, before it even hits the shelves of your local supermarket. If this all sounds too much like a scare story, it isn't meant to be. It's simply a matter of opening your eyes to how the food you eat is really produced. Sadly, the pictures on the packaging of your favourite foods often bear little resemblance to the realities of modern day food production. And if you're in any doubt, try this simple test for yourself. It's easy to do at this time of year, with many people selling their surplus fruit and veg for pennies on their garden gate. Just compare any home - or locally - produced food with that from your local supermarket. It may not look so perfect, but the smell and taste will be completely different. Your body will recognise the difference immediately and, interestingly, feel full more quickly as it gets the nutrition it requires. As an aside, this observation has been borne out by recent research, which has identified one of the many causes of obesity as being the poor nutritional content of food. Particularly in processed foods. In an attempt to fill the gap, more food is craved as the body tries to get the resources it needs. But, in a twist of irony, the whole process requires even more nutrients so exacerbating the problem further. The most important thing is to become much more aware of how your food is produced. We know that organic food is much more expensive, but this reflects how it's produced and the quality. A good – and less costly alternative – is the locally produced food you can find a plenty at this time of year. 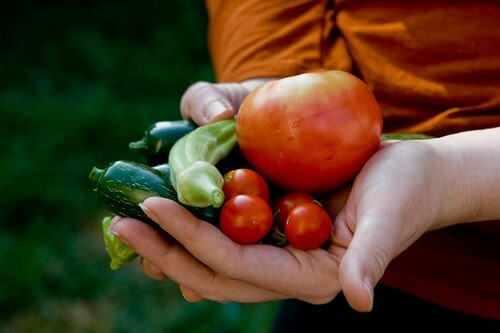 Or what about a local pick your own? Or foraging in the hedgerows in the autumn for blackberries and other goodies? Why not try growing some of your own food? We know that time – and space –are often at a premium, but salad related crops take up very little room and crop quickly. Or a seed sprouter on the kitchen windowsill. So what about multi vitamins and minerals? Our approach to a daily multi vitamin and mineral is to see it as an insurance policy. With the pace of modern life, particularly stress levels, it makes sense to top up the nutrients you're getting from your food how ever good your diet is. But, for those of you who are tempted to use it instead of making a few simple changes to your diet, beware. It'll catch up with you sooner or later! Are all multi vitamins the same? Sadly, no. Many off the shelf products are not of good quality, filled with additives, colours and fillers. Added to this, the vitamins and minerals they contain are in a form that the body finds difficult to absorb. Or are ones that additional nutrients are required for the body to be able to absorb them. Hence us agreeing that many supplements are a complete waste of money. An example of this we often come across are calcium supplements, taken to help strengthen bones. Unfortunately many of them don't contain the other nutrients needed by the body to be able to absorb – and use – the calcium. It's ironic that calcium on its own – without Vitamin D, phosphorous, magnesium and trace elements such as boron – leads to a weakening of the bones, as these substances are removed from the bones to be able to process it. Our advice would always be to go for a slightly more expensive product from an independent health food shop which is plant based. This means it's easy for the body to absorb and naturally contains all the other nutrients needed to gain the full benefit from it.